Info: Free vase worth $ 9.99! 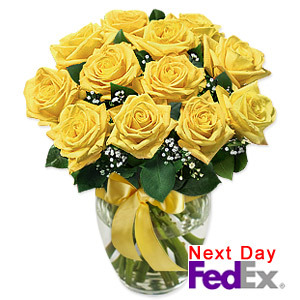 These bright 12 premium long stem yellow roses accented with greenery represent friendship, affection and remembrance and is a joyful gift for any occasion. A card message, floral preservatives & flower care information are also included. Flowers come elegantly wrapped in a decorative sleeve and are hand packed in an attractive gift box.